Glenbuchat was purchased in 1901 by James W Barclay form Henry Burra's estate. A keen reformer he replaced many of the old farmhouses during the early years of the 20th century. James William Barclay (1832 – 26 February 1907) was a Scottish businessman, farmer and politician. For nineteen years he was Member of Parliament for Forfarshire. He was the son of George Barclay of Cults, near Aberdeen and his wife Margaret née Massie of Maryculter, Kincardineshire. He was educated at Aberdeen Grammar School and the University of Aberdeen. He entered business as a manure merchant, and was also a major landowner and farmer. He farmed in Forfarshire, which had large amounts of grazing land for cattle. He was involved in the innovation of importing store cattle from the United States and Canada. In 1864 Barclay was elected to the town council of the royal burgh of Aberdeen. He continued to a member until 1871, and was leader of the "Progressive" grouping, allied to the parliamentary Liberal Party, that controlled the council. In June 1872 Colonel William Sykes, MP for Aberdeen died. Barclay was chosen as the official Liberal candidate. However, his reputation as a Radical led to a split in the local party, and John Farley Leith was also nominated as a "Moderate Liberal". In the event Leith was successful and Barclay was defeated. In January 1874 a general election was called, and Barclay was nominated as Liberal candidate for the Forfarshire constituency. He was elected, and held the seat for the party at the 1880 and 1885 elections. He was described by the Marquess of Huntly as "a thick-set man of medium height, dark-haired and swarthy. He had the misfortune to speak through his nose with a twang, and was not a success in the House of Commons as a speaker". In 1886 the Liberal Party split over the issue of Irish Home Rule and Barclay joined the break-away Liberal Unionist Party. At the ensuing general election he was returned as Unionist MP for Forfarshire. He was unseated at the next general election in 1892, when John Rigby regained the seat for the Liberals. Barclay did not run for election again, but devoted himself to agriculture. In 1901 he purchased the Glenbuchat Estate, where he pioneered experiments in new scientific farming methods. He was also an enthusiastic supporter of the Aberdeen Agricultural College. By the 16th century Glenbuchat had become Presbyterian and the name changed from the ancient Glenbuchat to Glenbucket. When James W. Barclay purchased the estate in 1901 he liked the name Glenbuchat and succeeded in having the government officially recognize that name. James William Barclay died in February 1907, aged 74, while on a visit to Nigeria. 1882, Lilian Alice Novelli, . (d. 1887) daughter of late A. H.Novelli, of Hyde Park sq. 1896, Agnes Clifford Smith, daughter of Rev. Hy. Smith, h.m.i. “J.W. Barclay was a Member of Parliament for Forfarshire in 1873 and appears to have held his seat for some considerable time. Prior to that he had represented the 1st Ward in Aberdeen town council from 1864-1867 and the 3rd Ward from 1868-1871. He was a ship-owner. He stood as a second, but unsuccessful Liberal candidate in the 1872 Aberdeen by-election, caused by the death of the sitting MP, Col. Sykes. John Farley Leith, also a Liberal, was successful. As noted, in 1873 Barclay ultimately succeeded in becoming an MP, but in a different constituency. It is not at all clear to me why Barclay stood against another candidate who was of the same party. The University of Aberdeen has a website called The Voice of Radicalism, which exhibits two items relating to Barclay. The first is his election poster for the 1872 by-election, which I will scan into this family tree. The second is a song called "The Electors Lament" sung to the tune of "Will ye no come back again" - apart from reading it on the website, you can actually hear it being sung! It is quite difficult (to me, at least) to make out the sentiment of the anonymous balladeer. There are references a'plenty to Barclay being in the China trade, which is interesting, given the subsequent union of his grand-daughter, Agnes Ida Milne, with J.C.O. Couper, also a descendant, of the China trade. I have tracked down two other internet references to Barclay. The first is a reference to a Parliamentary debate in 1873 about a Report from the Select Committee of the House of Lords on Land Improvement. Barclay, who is described not only as a MP but also as a farmer in Aberdeenshire, complained that the proposals for building labourers' cottages were unduly expensive, saying that "the houses of the Inclosure Commissioners are rather what I should consider suitable for the next generation than for the present one." His point was that they should build more cottages rather than a smaller number of superior quality. It says something of the times that the "superior quality" consisted in each cottage having a sink and that there should be no bed in the living room! Barclay also turns up in a paper by David Smith on "The Agricultural Research Association, the Development Fund, and the origins of the Rowett Research Institute. Barclay had something to do with the establishment of the Aberdeen Agricultural Association, later named the Agricultural Research Association, in 1875. I also found that a noted artist, Thomas Woolner, had made bronze medallions in 1885 of James Barclay MP and of Mrs Barclay. My mother's notes concerning him say that his first wife, Jane Smith, died when their child Florence was still very young. Florence was brought up by two aunts who lived in Cults. JWB subsequently married "an Italian beauty" and thirdly another woman who my mother knew only as Mrs Marlowe. "She called herself my step great-grandmother, very ancient, lived in London". I wonder whether the Italian beauty was the subject of the oil painting of a young woman in vaguely Italian costume which I sent to my brother Tom in America and which was subsequently lost in the fire at his home in the Berkeley Hills, San Francisco. My mother also noted that Florence had a brother who died young, and no sisters. Additional information - 17 June 2008. My mother's Uncle Barclay, as he was usually called - and we children also referred to him as Uncle Barclay. When my grandmother's Couper husband died, it is my understanding that Uncle Barclay effectively took charge of her affairs. It was then that she moved to Logie. I never completely understood the ramifications of the property of these people. Some years ago (about 2000) my mother made some notes for a family tree album in which she remarked that as a child she had been told that they were left badly off. This is hardly likely. When I visited my grandmother in Scotland in 1954 she was living in what we in Rhodesia would have described as a degree of affluence. Nevertheless, I understood that Logie somehow belonged to Uncle Barclay. So quite what he did with all her money I do not know. The first time that I actually met him was on that visit in 1954. He was a very stout, genial old gentleman with a red face and a small bristly moustache. He was very kind to me, supplying me with a .410 shotgun and unlimited quantities of cartridges for the purpose of shooting as many rabbits as I could. There was a major myxymatosis epidemic on, and everyone was trying to cull as many rabbits as possible. I also went and stayed with him at his shooting estate at Glenbuchat. That year had been very wet and there was no organised grouse driving, but I took part in a shoot, walking up on grouse. I also went out with my Cousin Bo for a deer stalk (unsuccessful); to my chagrin I was not allowed to take a rifle - these people had no idea that a Rhodesian boy of those times was accustomed to all kinds of shooting from a very early age. After Uncle Barclay's death, his eldest daughter Jean, who inherited the estate, sold Glenbuchat except for a portion on which she built a new house. Pat I visited her there in 1979. His main house, Kinaldie, was inherited by Bo, whom we also visited there on that trip to Scotland. Uncle Barclay went up in my estimation when he presented me with a French silver cornet made by Courtois that he had played in the Eton College Brass Band. Foolishly, I sold this to a friend at university. It was way off tune from modern instruments, and inspite of having a shank made that broadly speaking got the main harmonic intervals in tune, the keyed notes were never in tune. Shortly before he died, Uncle Barclay visited us in Africa, and either after that visit or maybe on his death, I cannot now remember, I received £1000 from him. This was very useful to us because it came just about the time of UDI, when Pat and I moved to Domboshawa for a year, and it enabled us to buy a very fuel efficient Renault 750 that was a great help during fuel rationing. I often wondered why he sent me (and I think also my siblings) this money. His sister Frances (Gog) who visited Bo in Rhodesia, told Pat that my mother had been diddled out of her full inheritance by the Milnes. Gog was a sprightly but rather malicious old lady, who clearly did not like my mother. There is an alternative family tree at this stage and it is unclear which the correct one is although I suspect the one above is the right one. “My mother notes that his main interests were shooting, stalking, fishing and reading. However, he was also a soldier. He served for a long time in the Volunteer Forces, and in 1911 (when an article was written about his seat, Logie) he was in command of the 1st Highland Brigade, Royal Field Artillery, in the Territorial Army. Later, as Temporary Lieut.-Colonel, he commanded the 157th Brigade, RFA, at home and in France during the Great War, from 1 February 1915 to August 1916, when he relinquished his commission. He held the Victoria Decoration (not to be confused with the Victoria Cross). According to the article, he acquired the Logie property in 1903 and set about improving it. The lands must have been quite extensive then, as it included a portion of Bennachie. When I visited Bennachie in the early 1980s there was some kind of memorial to him there. I think that he was instrumental in having the mountain become part of the National Trust for Scotland, or some such. Bennachie, incidentally, is sometimes suggested as the famous Mons Graupius where a decisive battle between the Romans and the ancient Britons was fought. One of the pictures I have annexed shows him in the background, kitted out in kilt and with his shotgun, with Lady Forbes in the foreground. 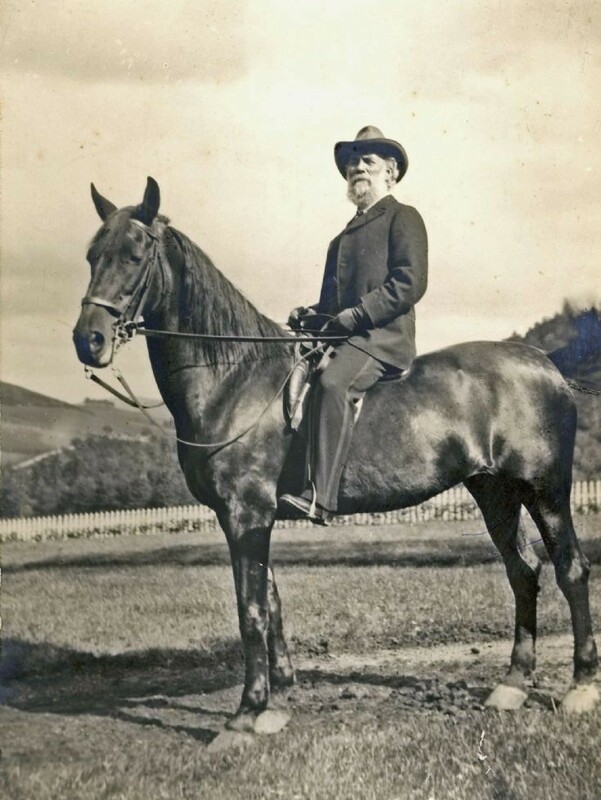 This picture comes from a Scottish recipe book that was enlivened with characteristic photographs, and it was given to me by my cousin Bo, who described him as "the old warrior"
Sons and Daughters of Florence Barclay and Col. George Milne later Laird. Milne James Barclay, Major, Royal Field Artillery.